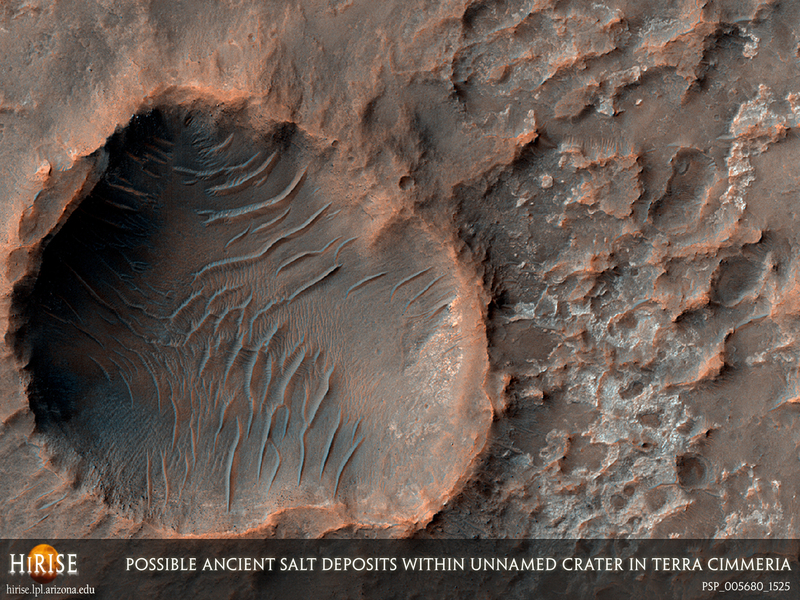 The ancient cratered highlands of the southern hemisphere of Mars has an intriguing and complex history as it has been riddled with impact craters and modified by volcanic processes and by the wind. Additionally, it is one of the most heavily dissected terrains on Mars exhibiting the densest population of valley networks: old dried up channels and valleys that may have been formed by surface runoff, the seepage of ground water, or both. 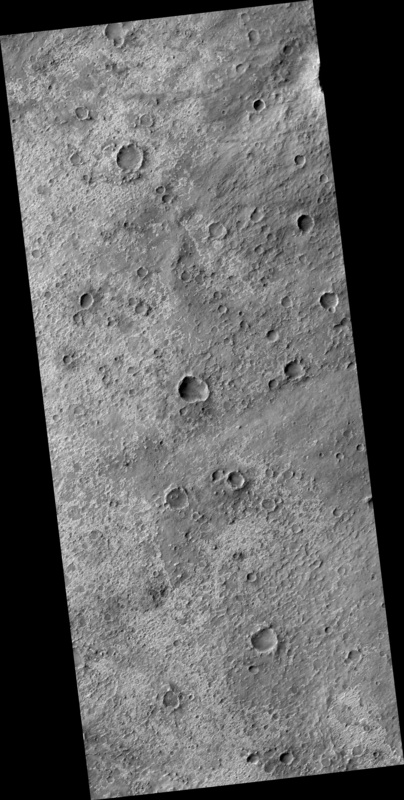 Recently, the Thermal Emission Imaging System (THEMIS) aboard Mars Odyssey (MO), in conjunction with spectral data from the Thermal Emission Spectrometer (TES) aboard the Mars Global Surveyor (MGS) have revealed the presence of a unique surface deposit that may be rich in chloride salts formed from the presence of liquid water. Three separate missions (MGS, MO and MRO) have come to reveal the composition and nature of these unique deposits, which, although they occur as relatively small deposits (less than 25 square kilometers) are widely distributed in Noachian (most ancient) terrains with fewer occurrences in the Hesperian (middle geologic time) terrains. 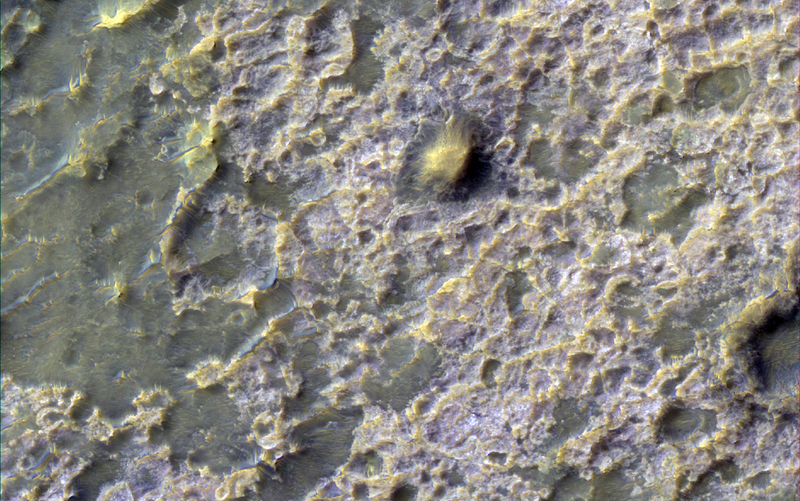 This HiRISE infrared color sub-image (approximately 900 meters wide) shown here is part of one such deposit in an ancient partially buried unnamed crater in Terra Cimmeria, that shows this deposit in a light-toned almost fleshy color. The deposit appears to be relatively thin and occurs in low-lying areas. It is also heavily pockmarked and discontinuous, possibly from removal of the material by erosion. Both of these aspects suggest that the deposit is indeed very old. NASA’s Jet Propulsion Laboratory, a division of the California Institute of Technology in Pasadena, Calif., manages the Mars Reconnaissance Orbiter for NASA’s Science Mission Directorate, Washington. The HiRISE camera was built by Ball Aerospace and Technology Corporation and is operated by the University of Arizona.